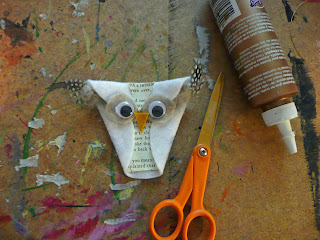 This little Snowy Owl is one of the crafts for Christmas Craft Day 2010 which is taking place on Friday Dec 17th. 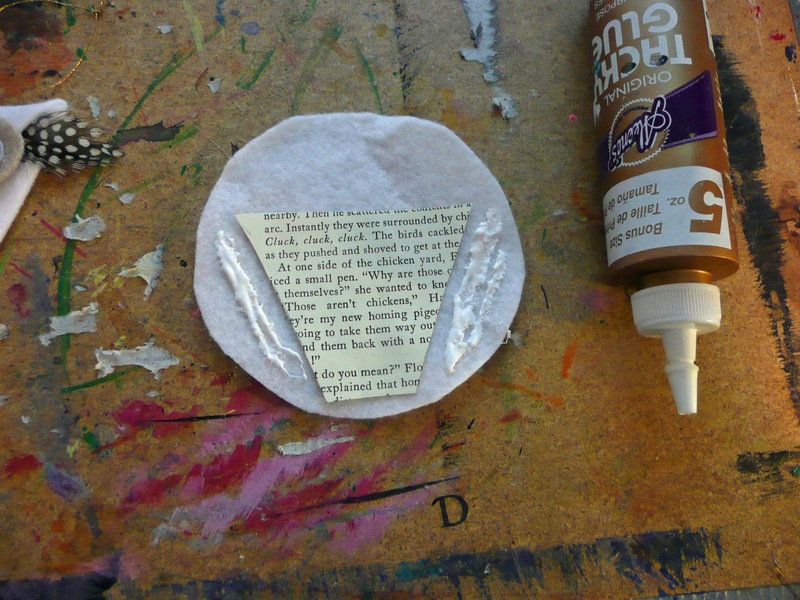 Using the yogurt container or some other round object trace out a circle on your white felt and cut out. Find some old book pages. I usually pick up some old books for crafting at garage sales or the library discard sale. I especially like old kid's books like this Bobbsey Twins. You need to cut a small triangle for the Owl's forehead and flower pot shape for the belly. 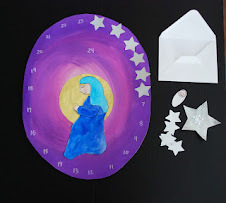 For Christmas Craft Day I will have templates. 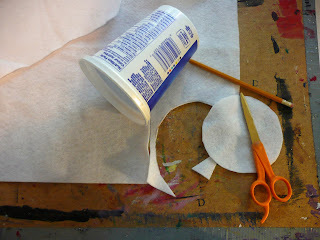 Glue your flower pot shape onto the white felt slightly down from the middle. Put some glue on the felt on either side of the shape. Fold the felt over and hold for a few seconds while the glue sets up. You can use some clothespins to help you out. 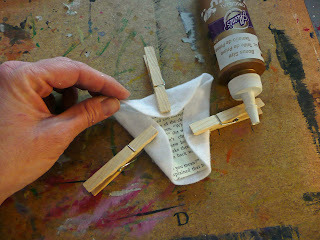 Put a dab of glue at the top of your flower pot shape and fold the felt down. You want to keep the ends open. Place a little bit of glue into the open corner and add a feather. 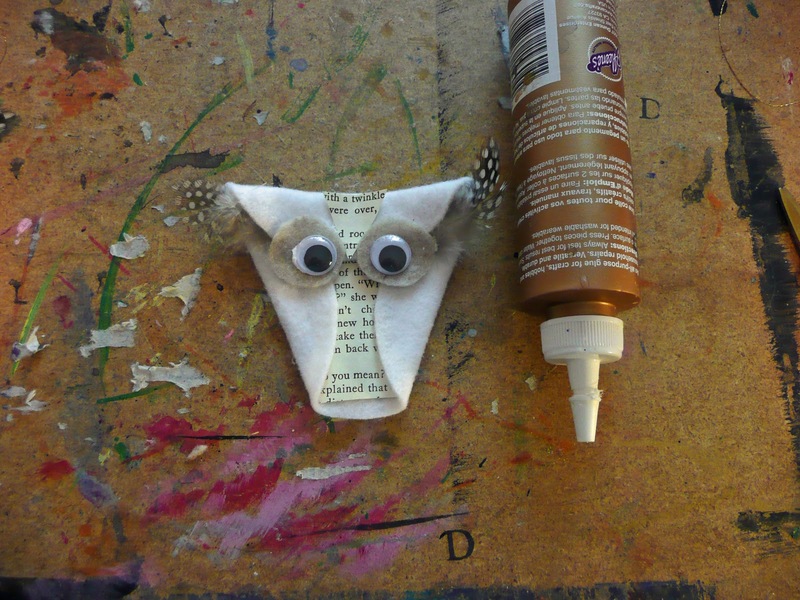 Glue the little triangle onto the forehead. 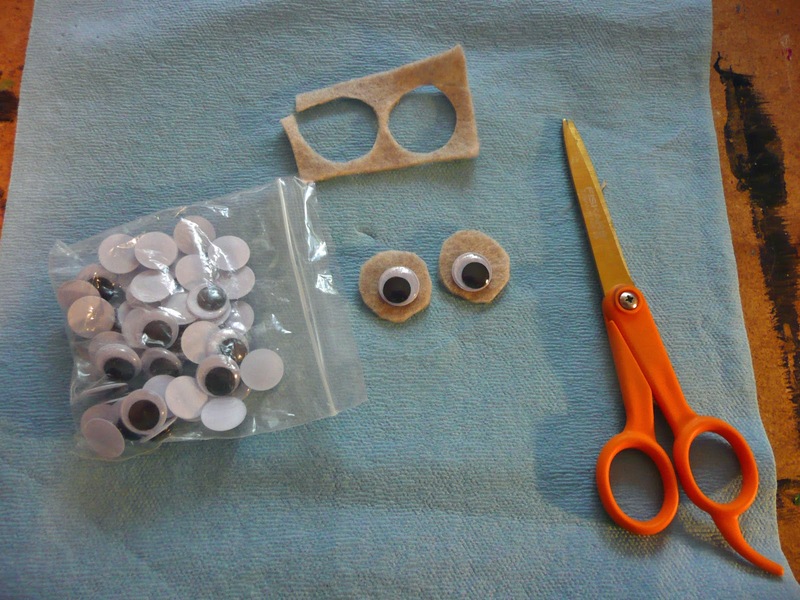 Cut 2 circles from the tan felt that are larger than your googly eyes. Glue into place on the owl. 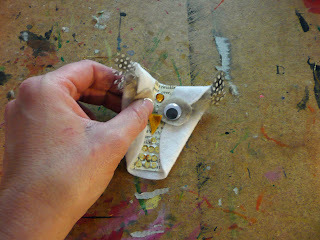 Cut a little beak triangle from the gold felt and glue into place. 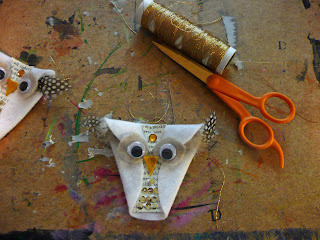 Using a needle thread some gold thread thru the top of your Owl and make a loop for hanging. 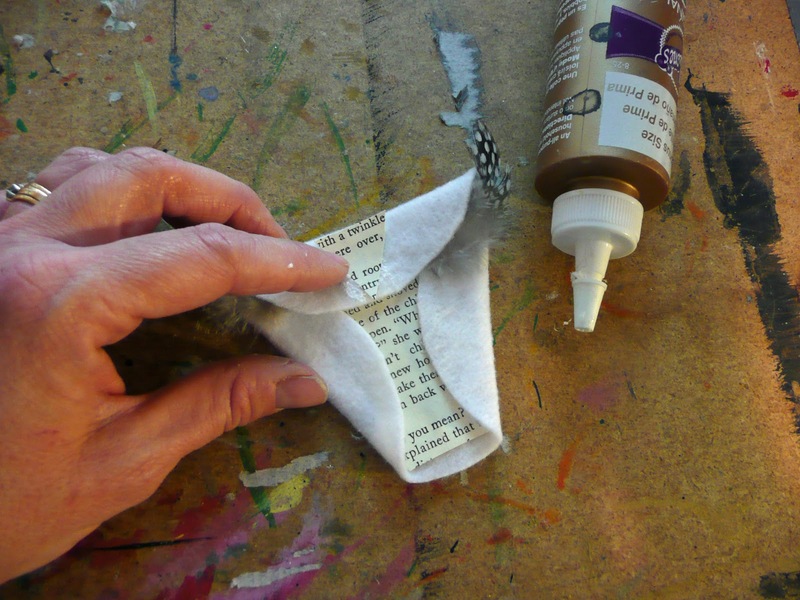 If you want you can gently fold it in a bit to add a little shape so it isn't so flat. Why not make a pair of Snowy Owls for your Christmas tree. 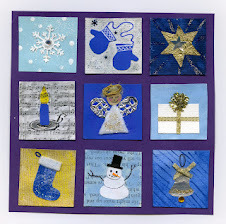 I'll see you soon with more Christmas Crafts for Craft Day we just got a bit sidetracked this week by the stomach flu(the kids). This is really cute and looks like fun! these are so adorable! the technique reminds me of a model magic owl we made in fall of last year (09) -- (check out the post called "abradacabra" on paint cut paste.) i so love owls! we'll have to try this! Oh I do LOVE this Owl. So sweet and pretty! Your crafts never cease to wow me! Thank you! Super cute. 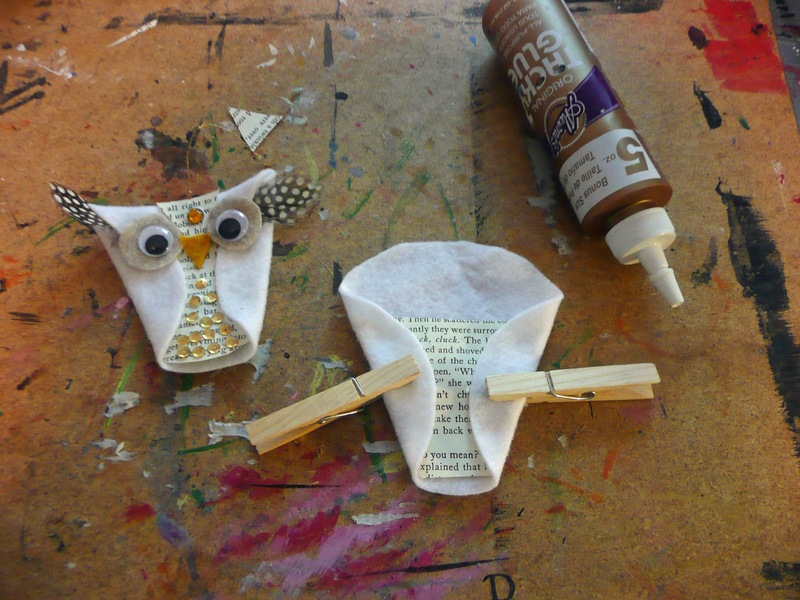 My girls are into owls -- what a fun craft. 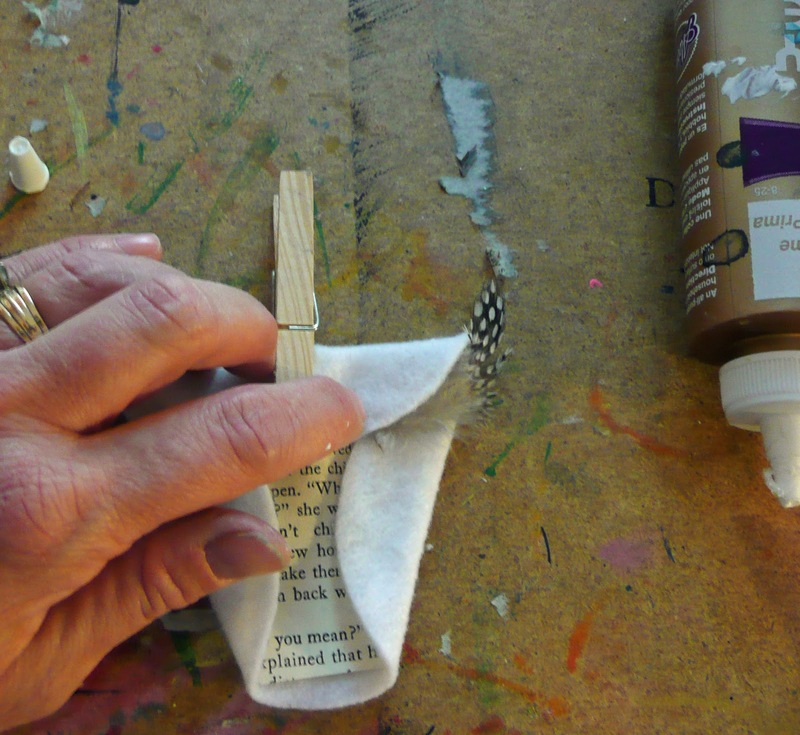 This is great and I LOVE that you work with old books. What a brilliant idea! 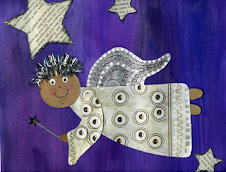 We were downed by the stomach bug at my house--short and painful! Must do art to recover! 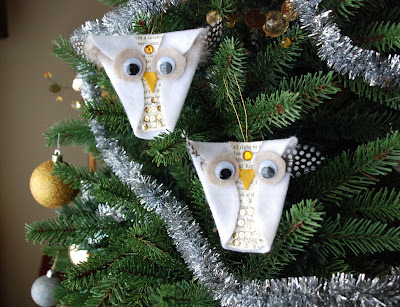 This is a really brilliant idea and the owls are so cute! Thank you for the great tutorial! 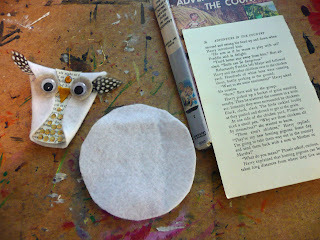 Would you mind if I borrow the image of the owls and link this post to my blog? You are welcome to borrow the image if you link back. Thanks for asking! Thanks erveyone for the terrific comments and I hope you feel better at your house Paula. You are such a gift on this chilly December day...tomorrow, our final day of first grade is our Fa la la la la day....doing things that make us feel happy. We will have stations of crafts, stories, and this ornament couldn't be more perfect because we have just finished a study of owls! It couldn't be more perfect! Thank you and happy holidays. This is so very cute. 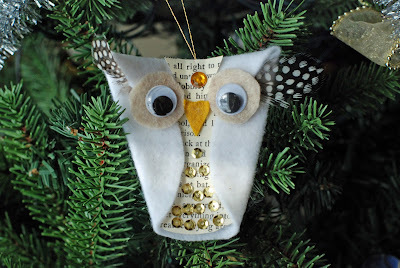 May I make a link to your post on my blog, so that I can remember to make these with my ornament club? Hey Kathy feel free to post as long as there is a link back, thanks for asking and Good Luck with the Snowy owls, Merry Christmas! Thank you so much Gail. I have created a post today and I am gathering my supplies for this cute creation. Beautiful! I just love these and can't wait to try some. I know some owl-admirers! Of course, who isn't! 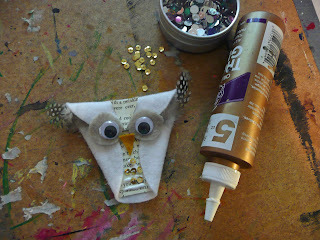 I love owls and I have 4 boys. Luckily, owls aren't too girls ;) We made them in December and I kept meaning to come back and thank you for the idea. I received a bunch of old music sheets in the used piano bench I got at an estate sale. 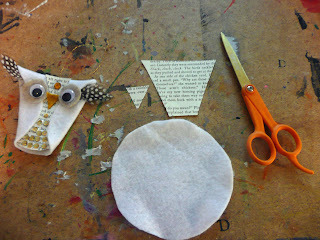 We pulled out Christmas songs and used it for the paper sections of the owl. They really are so adorable, I hated packing them away. 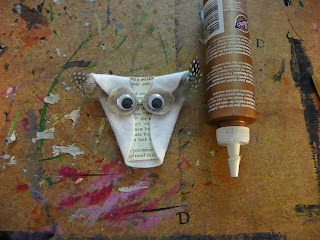 We made these last year while we read the first Harry Potter book. The kids were so proud of thier "Hedwigs." 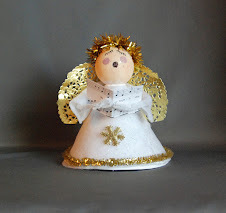 Now they are with the Christmas ornaments waiting for the holidays. Thanks for such a cute and functional craft! You can pin as long as you retain the link back to the site and not just the picture. These are adorable! Just made my first one and got templates together. Thanks to your creativity these will definately be a hit at our annual Girl Scout "Breakfast with Santa" and ornament sale. Thank you! I did this in class today and I love it soooo much! I did different colours and they look really good on our class christmas tree until we had to take them home! What size is the circle for the body and eyes? So cute. Going to use this for a Girl Scout project. The circles are 11.5 cm or 4.5 inches in diameter. (just a standard yogurt or source cream container diameter) The google eye is 1.8cm or .75 inches so the tan felt circle they sit upon is about 2.5 cm or 1-1.25 inches in diameter. Hope that helps and good luck .